Our Greek DMC Metropolitan DMC is a Destination Management company based in Athens Greece, with over 30 years of experience in event management of incentives & corporate events in Athens and the Greek Islands such as Mykonos, Santorini, Crete, Rhodes, Corfu as well as Halkidiki and the Peloponnese. Metropolitan DMC is actively involved in destination management in Greece; a member of SITE International since 1999 & instrumental in setting up the local Site Chapter Greece, as well as a founder member of World of DMCs. 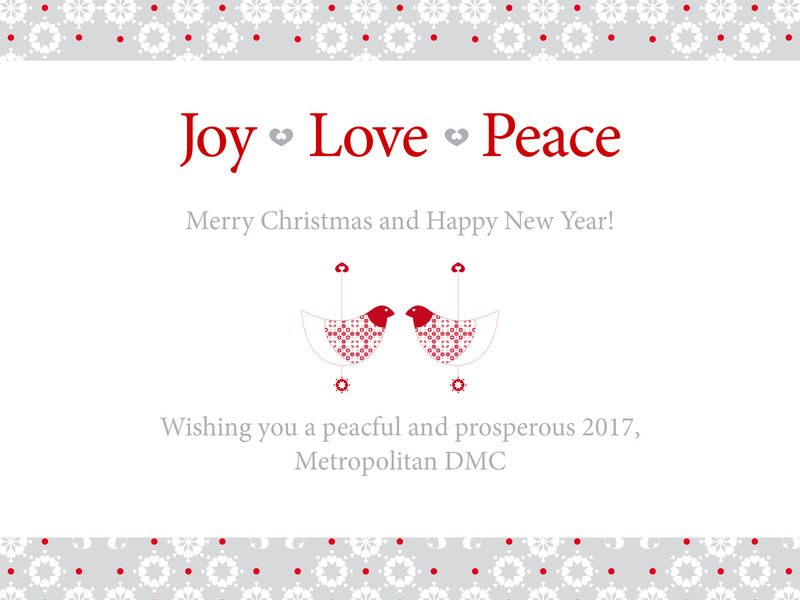 Metropolitan DMC recently became the only Greek member of ADME. Greece offers a spectacular location, unique history & heritage, safety, value & excellent hotel and conference infrastructure with easy access from more than 65 international destinations to Athens, most of the Greek Islands & major inland areas. It provides countless opportunities to the delegates to experience a unique and memorable corporate event or Incentive. 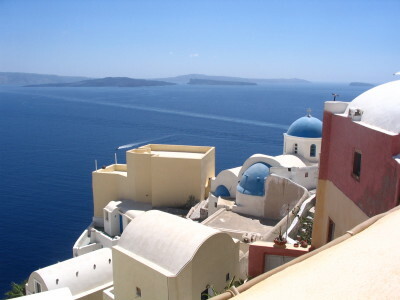 The year-long mild climate with plenty of sunshine, natural beauty and delicious Greek cuisine makes Greece one of the most popular corporate destinations in the World. 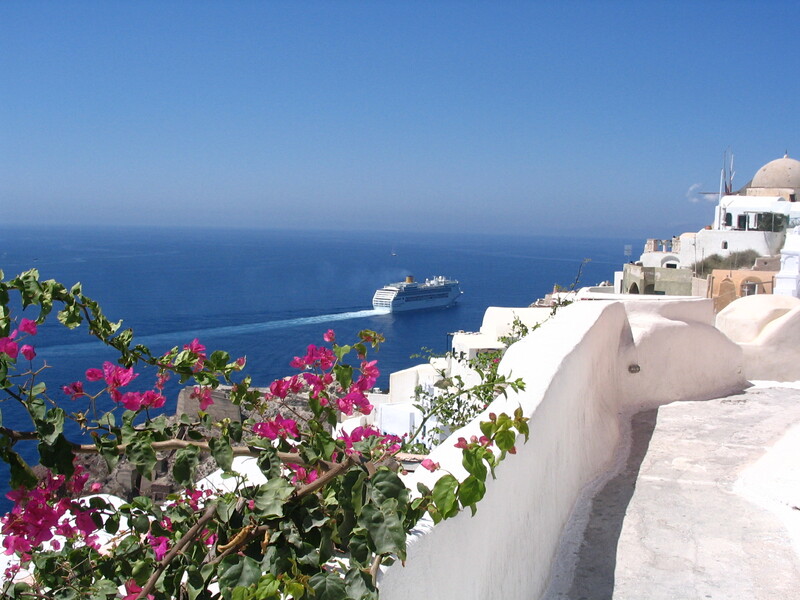 The synergies of Greece’s developed leisure sector perfectly complement the Corporate and conference market. 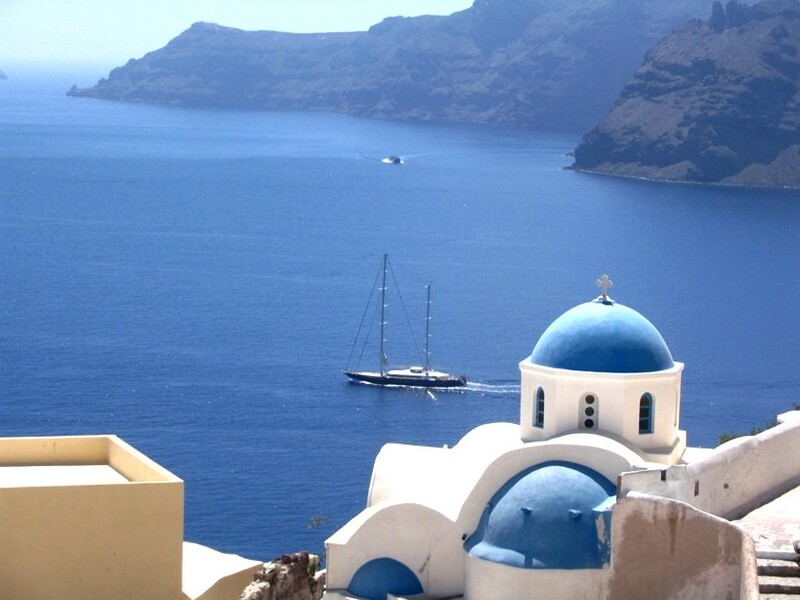 Greece is a word that conjures up images of unparalleled history, sparkling blue waters, sun drenched beaches, white washed island houses, and spectacular sunsets. But history and sunshine are only a part of what qualifies Greece as a unique incentive destination. 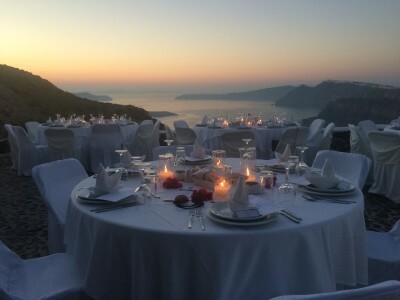 The charm & hospitability of Greece combined with the modern infrastructure and high standard of services, easy access from around the world, cultural attractions, modern amenities & diverse entertainment make Greece a favourite meeting & incentive destination. Unique locations with charm & natural beauty fulfill the need for venues with multiple benefits: superb facilities, outstanding locations and a wide range of leisure attractions. A unique destination Athens is a must see European destination, perfect for memorable incentive events and meetings that combine business and leisure. 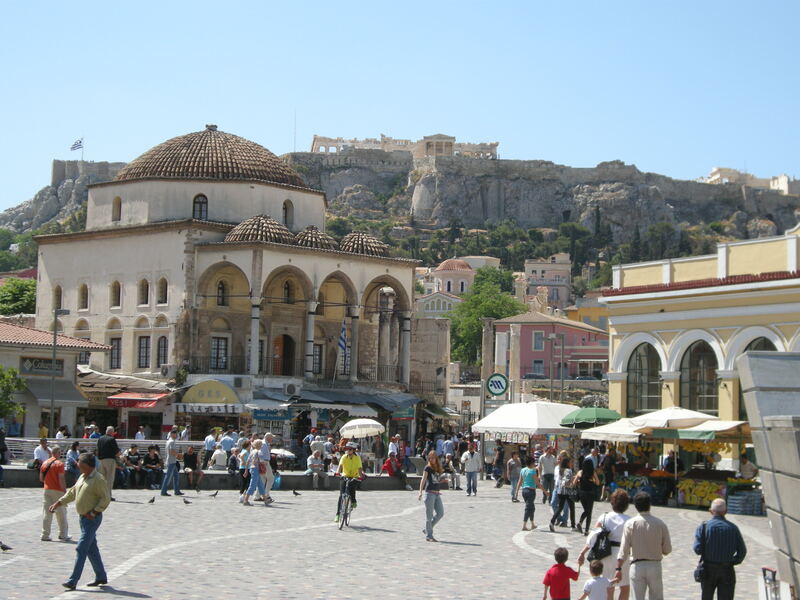 The rich cultural heritage of Athens is just one layer in the multi-faceted modern city. The immediate and lasting impression is one of energy and vibrancy. It is a sophisticated cosmopolitan hub with easy access from all major airports. 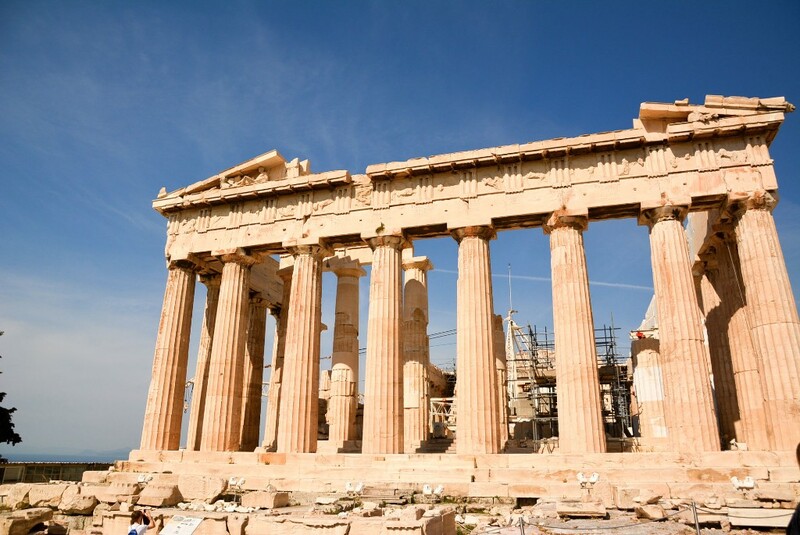 Athens, the gateway to Greece, both ancient and modern.Dominating the Athenian skyline, the Acropolis & the Parthenon Temple represent the Golden Age of Greece & the birth of modern civilization. 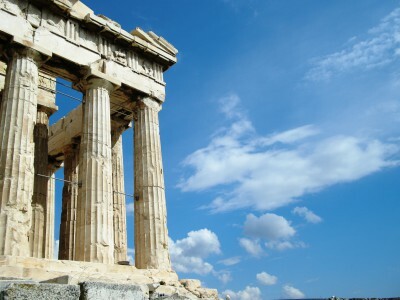 At the foot of the Acropolis with its monuments symbolizing everlasting spiritual values, modern Athens has grown into a bustling metropolis, yet still retains its unbreakable links with its glorious past and traditions. The majority of archaeological sites have been perfectly integrated into the contemporary city & the countless museums present a vibrant cultural scene alongside modern hotels, award winning restaurants and exciting nightlife. Athens is the only capital in Europe with sandy beaches & crystal clear sea just 20’ from the centre. In the leafy suburbs of the South coast, deluxe resort hotels give the impression of an island although the city is so close. It also has islands just an hour away. 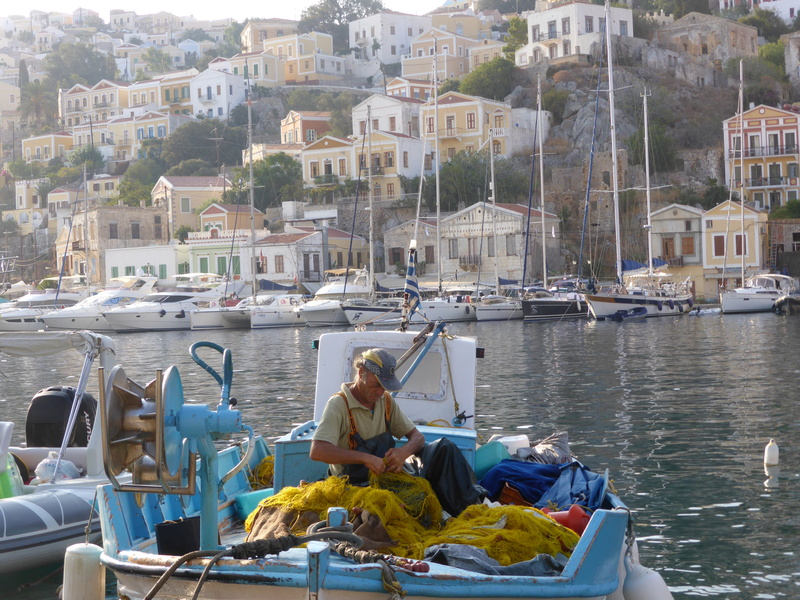 Feel like a millionaire on a luxury yacht for a day visit to one of the islands of Hydra, Aegina, Spetses & Poros. Each one is a delightful escape from the big city. 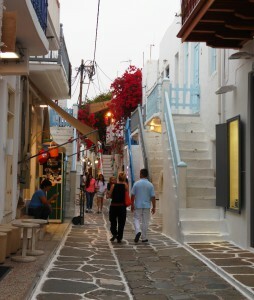 Mykonos is the epitome of a Greek Island. 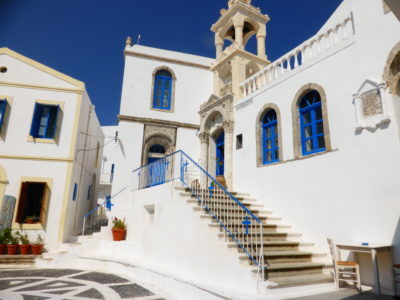 The picturesque fishing village of the 1960’s has grown into a cosmopolitan destination with its own unique character; chic, sophisticated & charmingly simple at the same time. 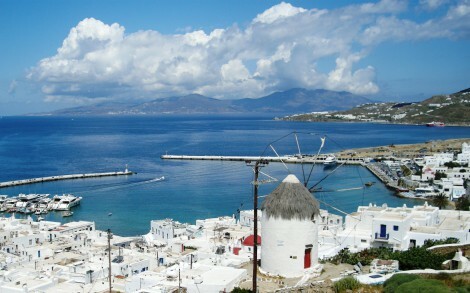 Mykonos offers hedonistic delights of chilling out on one of the many beaches, dining at the simplest tavern or a Michelin starred restaurant, designer shopping, clubbing & partying to your heart’s content. 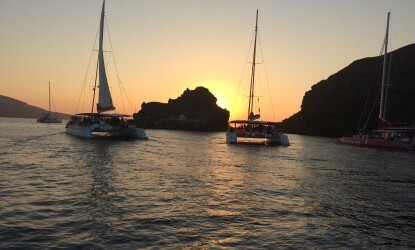 Metropolitan DMC enhances the Mykonos experience with themed parties, Greek village party, Onassis Night, Shirley Valentine beach party or visits to nearby islands on luxurious speed boats. Off-the-beaten track Jeep tours show the wild side of this tiny island, while horse riding on sandy beaches, snorkeling or beach hopping by wooden fishing boat keep the adrenalin flowing. 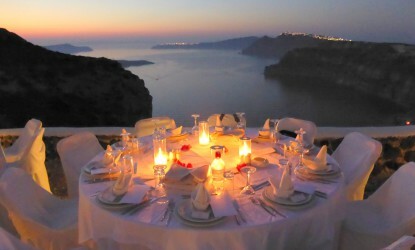 Santorini provides an unforgettable experience & the perfect incentive reward. 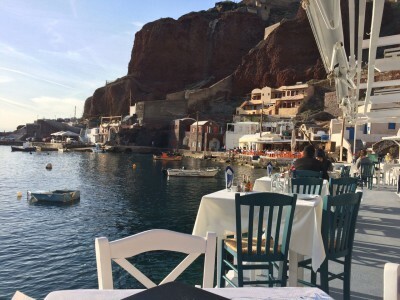 The most breathtakingly romantic of the Greek Islands it is a place of stark contrasts between steep black cliffs, whitewashed buildings & azure blue Mediterranean sky & sea. Santorini is a small crescent shaped island; the remnants of a volcanic caldera. The excavations at Akrotiri unearthed a Minoan town buried by ash & lava in that volcanic explosion, preserving the vibrantly coloured wall-paintings of Thera. Gastronomic destination. Verdant vineyards & black volcanic beaches with whitewashed villages punctuate the landscape. The island is a gourmet’s delight with many local specialities and renowned world class wines produced from the volcanic soil. Metropolitan DMC sources unique locations for your event, such as wineries with breathtaking views over the caldera. 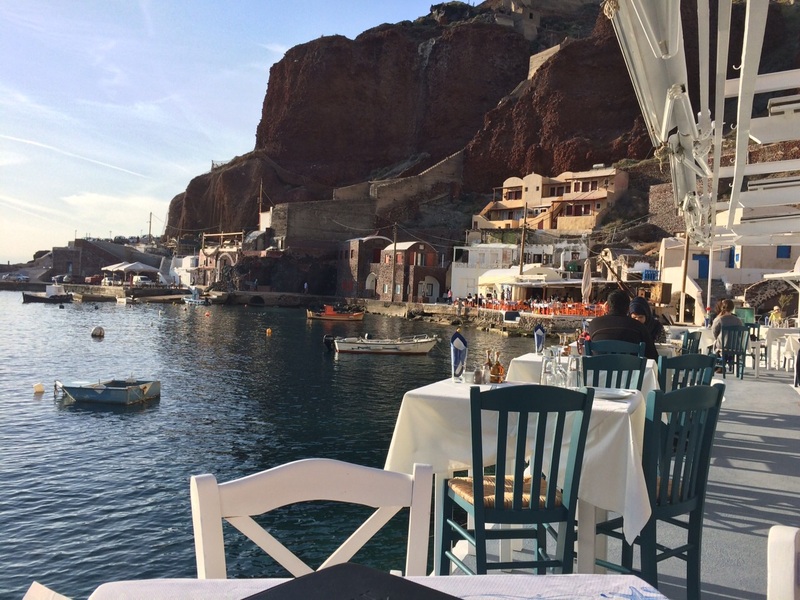 Chic Oia, at the northwest tip of the island, is famous for the 360 degree views of the spectacular sunset. 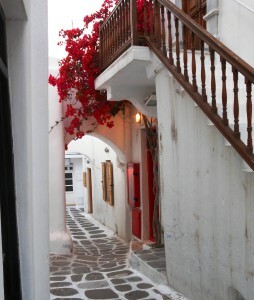 The villages on the island retain their authentic charm as the traditional rhythm of island life continues. These unique properties and venues have the charm and mystique of a bygone era and are ideal for creating memorable, once-in-a-lifetime event experiences! The stunning appearance of this stately palace takes the visitor back in history to when the palace was inhabited by two great figures from European history whose only common bond was their adoration for Corfu, Greece and its culture: Empress Elisabeth of Austria (known as ‘Sissi’) and Kaiser William II of Germany. Only 10km from the town of Corfu, the palace is the perfect setting for a gala dinner, product launch, meeting, or even a wedding. Opulent, iconic, memorable: ideal for creating that tailor-made, behind the scenes experience an incentive is all about. 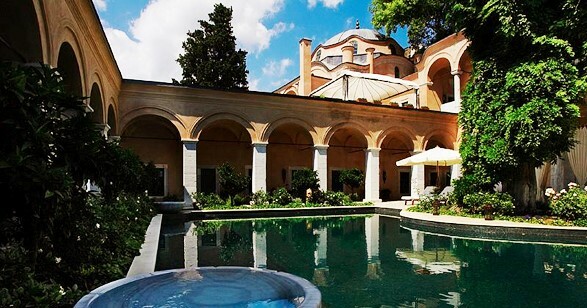 The Kinsterna Hotel, once an impressive mansion and estate dating from Byzantine, Ottoman and Venetian times, has carefully been returned to its former glory with an air of luxury. 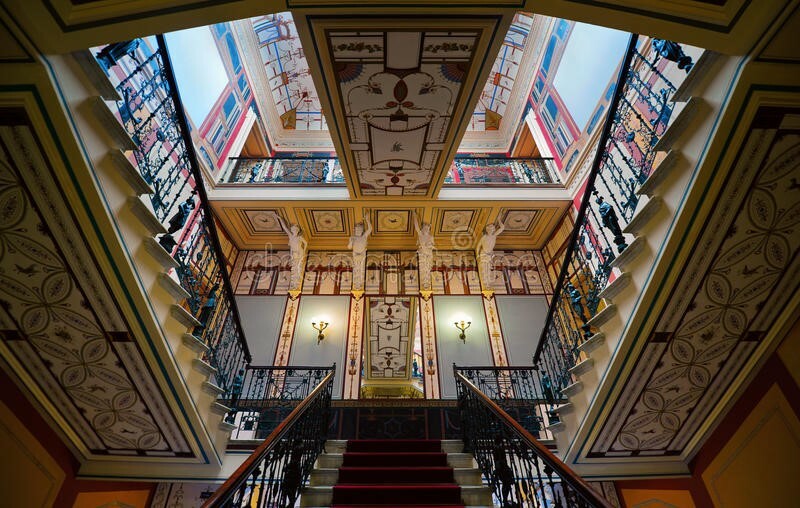 Today there are numerous features in the mansion’s original construction and design that can be spotted everywhere and deserve a guided tour by one of the hotel’s knowledgeable staff members. From the old chandeliers, armchairs and inside water canal to the handmade lace in the rooms and studded fireplace, each chamber has a unique story to tell. 52 rooms & suites in total make this a boutique property ideal for buy outs for launches, meetings and incentives. Location: 7km outside Monemvasia, in the SE Peloponnese. Roughly a 4hr drive from Athens. 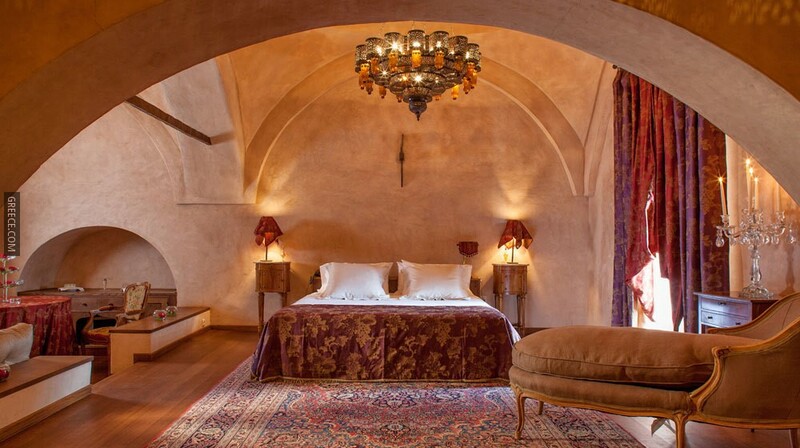 Imaret is an intimate and luxurious property, located within the homonymous historical monument, built in 1817 in the historical district of Kavala, northern Greece. The monument is a rare example of late Ottoman architecture in Europe. The variety of decoration, quality of the delicate structures, the interaction between indoor and outdoor spaces create an original complex of high aesthetic and cultural value. The hotel’s actual bedrooms lie beneath the graceful domes of the original construction with some of them overlooking the bay of Kavala and others radiating from the light of the orange tree garden. 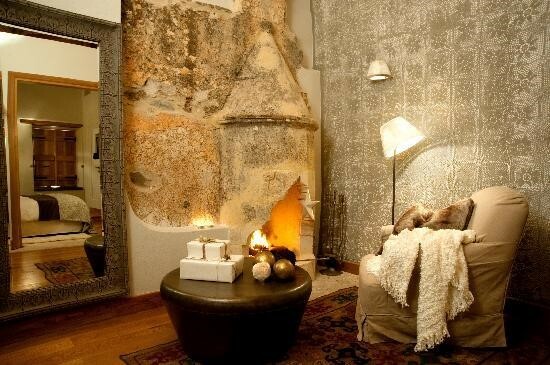 A large variety of exclusive room amenities and candles create Imaret’s indisputably essential atmosphere. 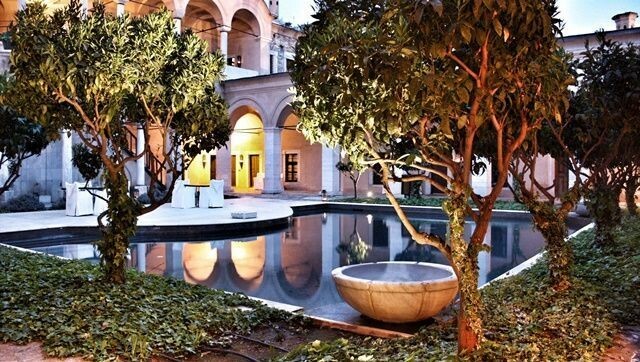 All 26 rooms are surrounded by three thousand square meters of inner gardens and marble arcades, reflecting the charm of an original Islamic garden set in the past. The variety of plants and peaceful areas, the candlelight and the whisper of running water and soft music make the complex a harmonious setting for relaxation and meditation. 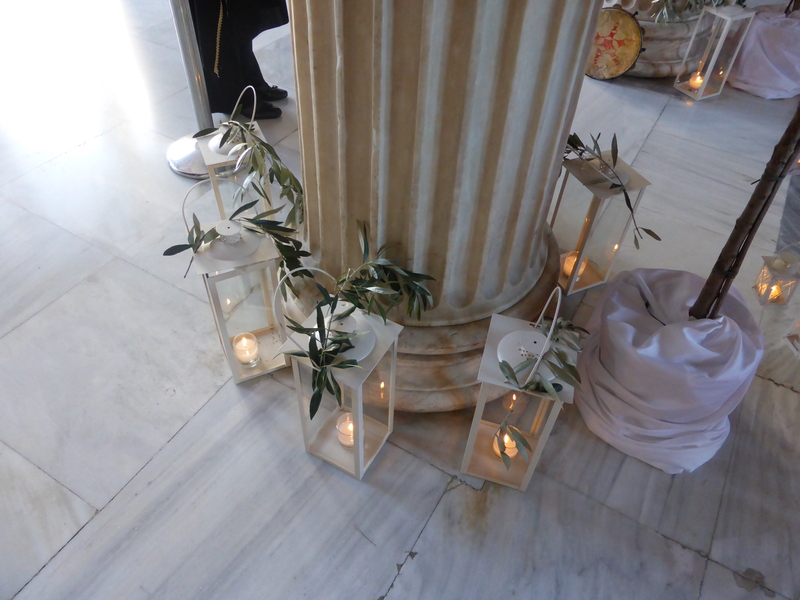 For these and many more ideas for stunning venues in Greece, talk to us now! An integral part of an incentive itinerary is being able to provide winners with a once-in-a-lifetime experience; a view of the destination not available to regular visitors and tourists. This is at the very centre of our product design and we are always looking for new, exclusive experiences to add to our “arsenal” of ideas, making Metropolitan DMC one of the most forward-thinking and innovative event companies in Greece. The trireme was an ancient vessel, a type of galley used by the ancient maritime civilizations of the Mediterranean, especially the Phoenicians, ancient Greeks and Romans. The Athenian fleet was comprised of 300 – 400 of these 70-ton, 40-metre warships, making it the most powerful ancient city-state to rule the Aegean. The trireme needed 170 men, one man for each oar, to operate it. The amazing thing about the Athenian triremes was that rowers were free men – not slaves – and came from all social strata: the rich and poor rowed alongside each other. For the Athenians, this was an extension of their democratic beliefs. Quite a revolutionary idea for the times! Most of the rowers (108 of the 170), due to the design of the ship, were unable to see the water and therefore, rowed blindly. Coordinating the rowing required great skill and practice. We believe this is the very essence of teamwork: a group of people/colleagues working together in perfect coordination, toward a common goal. What better way to drive this message through, than an exclusive sail of this legendary ship, by and for company employees? We are very proud to have been granted permission by the Hellenic Navy, to charter the “Olympias”, a perfect replica of an ancient Athenian trireme, for corporate events! We are thrilled to bring this unique, once-in-a-lifetime experience to our clients. Two brothers, determined to keep the family legacy alive, have for the last few years dedicated their free time and savings to refitting public buses that were taken off the streets between the mid-80s and early 90s. These beautiful vehicles feature vintage wooden seating and original 60s design. They include a 1966 Scania 28seater, a 1970 Mercedes 30seater, a 1961 Mercedes/Biamax 31seater to name a few. All vehicles are fully insured. 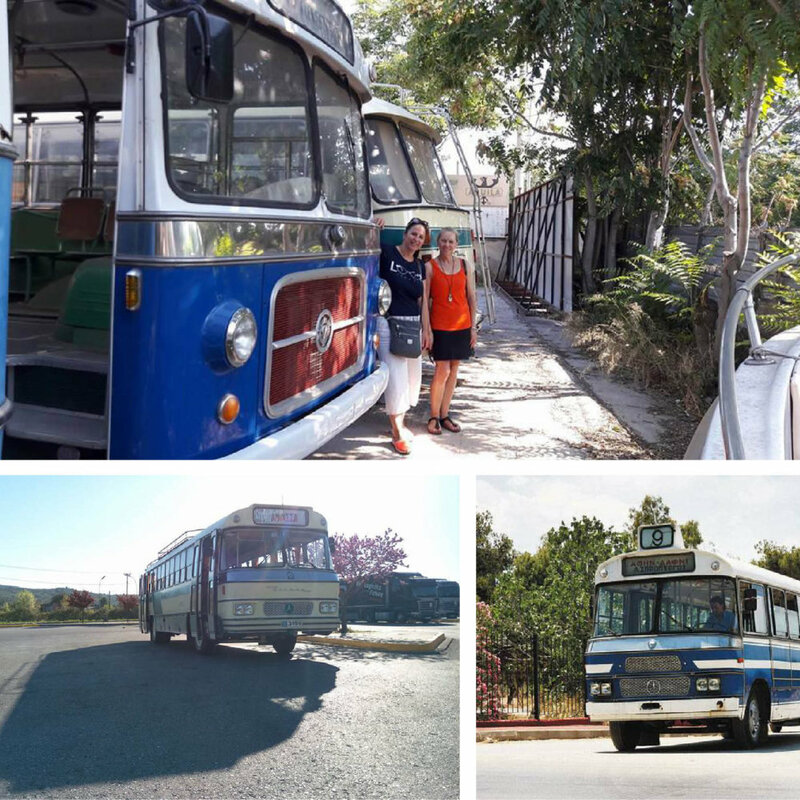 A ride in these adds a touch of class but also fun to a transfer, either as a published feature of the itinerary, or choreographed to take winners by surprise, with their regular vehicle “breaking down” and everyone being picked up by a vintage bus that just happens to be in the vicinity. Using these vehicles represents a CSR event as charges will be in the form of a donation to keeping this legacy of Greek civic history alive. 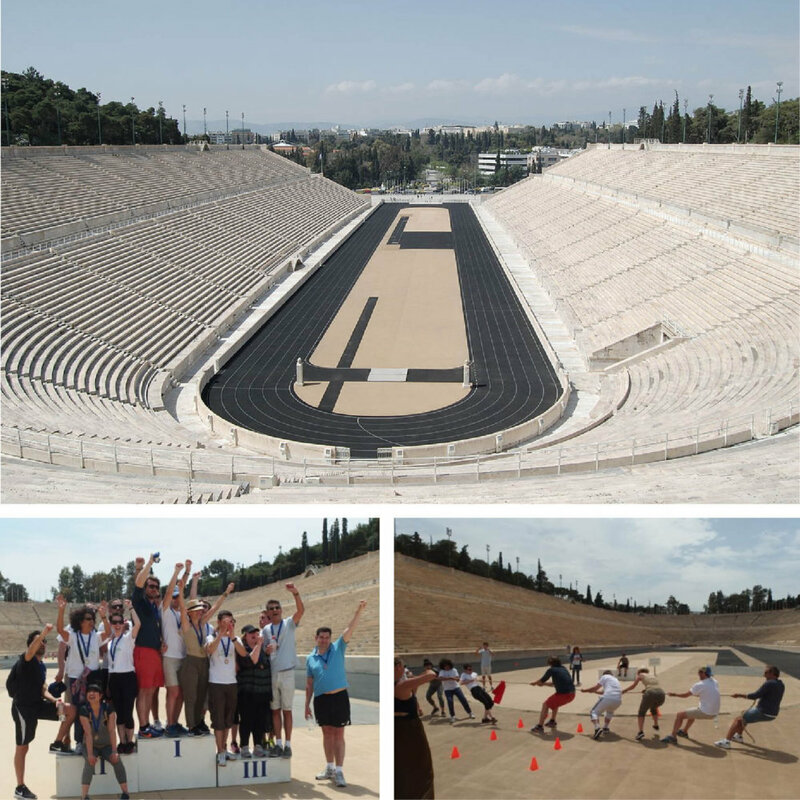 The Panathenaic Stadium is a classical cultural monument of Greece, a venue for noble competition and fair play of mind and body, since antiquity. 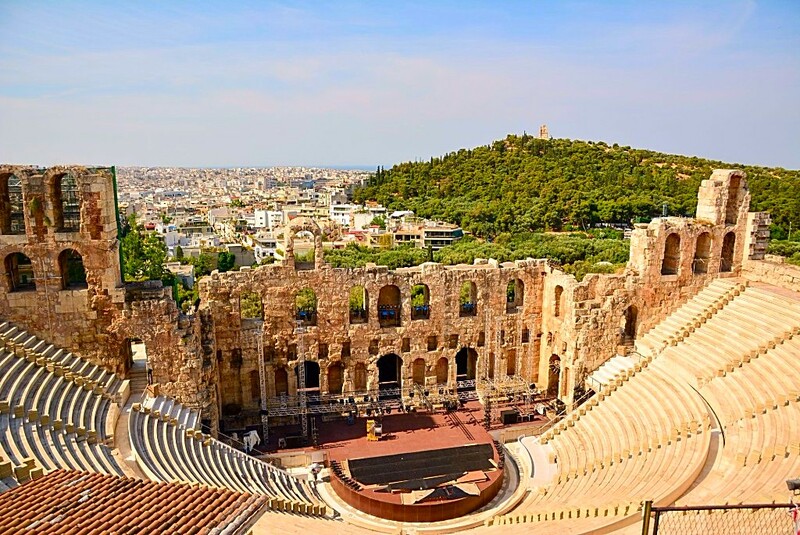 It was built for the 1896 first modern Olympic Games, the finishing point for the Marathon in Athens 2004 Olympic Games as well as being the spot from which the Olympic Flame begins its journey to the cities of the Olympic Games around the world. The event is a fulfilling activity inside an Olympic site with all the ideals of the Olympic Games, providing the chance for teamwork, responsibility & most of all fun. The activities include classic Olympic events such as sprint, relay race, shot put, javelin, long jump as well as tug-of-war. Located near the sea, 10’ drive from the centre of Athens, the brand new Stavros Niarchos Cultural Centre houses the National Library of Greece and the Greek National Opera, tucked beneath a new 170,000-square-metre sloping park and beside a 400-metre-long rectangular lake. The opera and library complex overlooks a plaza dubbed the Agora, a tribute to the beloved Ancient Greek market place, while the Lighthouse, a 900 m2 glass shell observatory with indoor & outdoor areas offers unobstructed views of the city and sea. 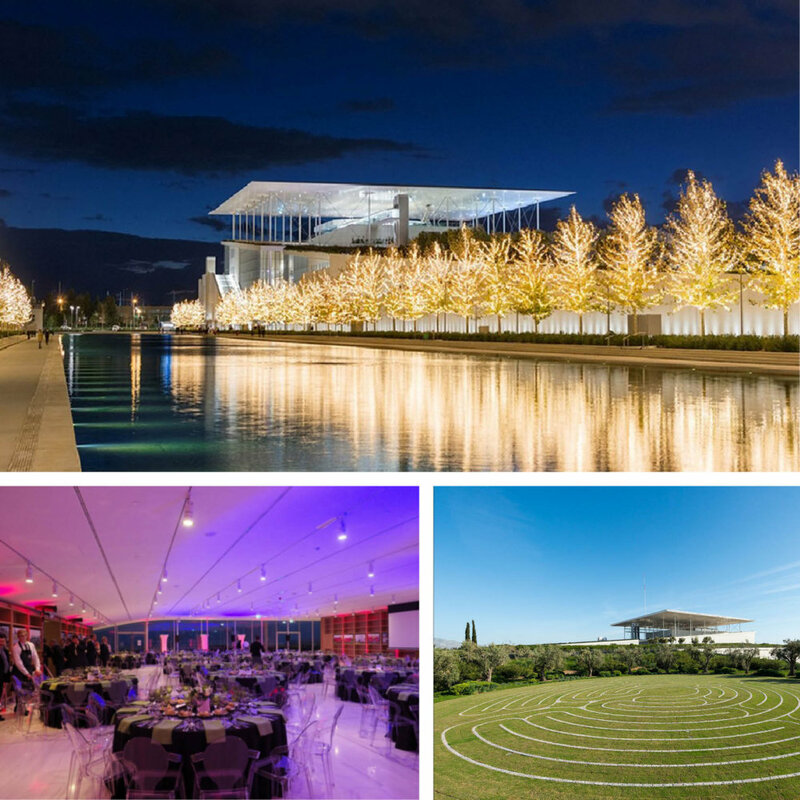 This breathtaking venue symbolizes the pinnacle of achievement & success for winners. Astir Palace Vouliagmeni is a hospitality market leader with a history of over 50 years during which it became a world renowned luxury destination. In preparation for the Hotel’s rebirth as the new Four Seasons Astir Palace Hotel Athens, more than EUR 100 million is being invested. The facilities will be completely state-of-the-art, and include the latest green technologies, including energy conservation and bio-climatic living quarters. Features will include approximately 300 rooms, suites and luxury bungalows; spa and recreational facilities; state of art conference and event spaces; infinity pools; beaches; a unique beachfront promenade; and more. With interiors designed by Meyer Davis Studio, the concept draws heavily on inspiration from the beauty of the surrounding environment and local culture, embodying a contemporary yet timeless luxury design ethos with unique attention to detail, and establishes a connection to the property’s history. 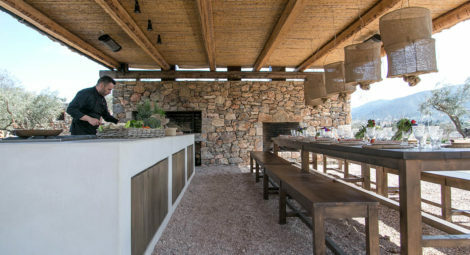 Select food and beverage outlets, conceived by Martin Brudnizki Design Studio, will introduce new culinary dining concepts of local and international cuisines. A Destination Resource Management Company is a newly coined term to define MICE professionals who have taken destination management to a higher level. Companies that, with their in-depth knowledge of a destination, experience & expertise in orchestrating the best of all local resources & infrastructure, refine the process and create exceptional events that support clients’ objectives at all levels from concept to fulfilment. The DRM Company fully understands the clients’ goals & endeavors to achieve them, keeping the customer’s interests foremost at all times. As a SITE member & DMC of 17 years, we at Metropolitan DMC align ourselves with this concept & philosophy of striving for continuous evolution to provide ever greater value for our clients. 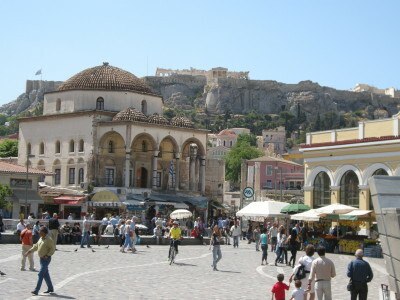 Athens, but not as you know it! 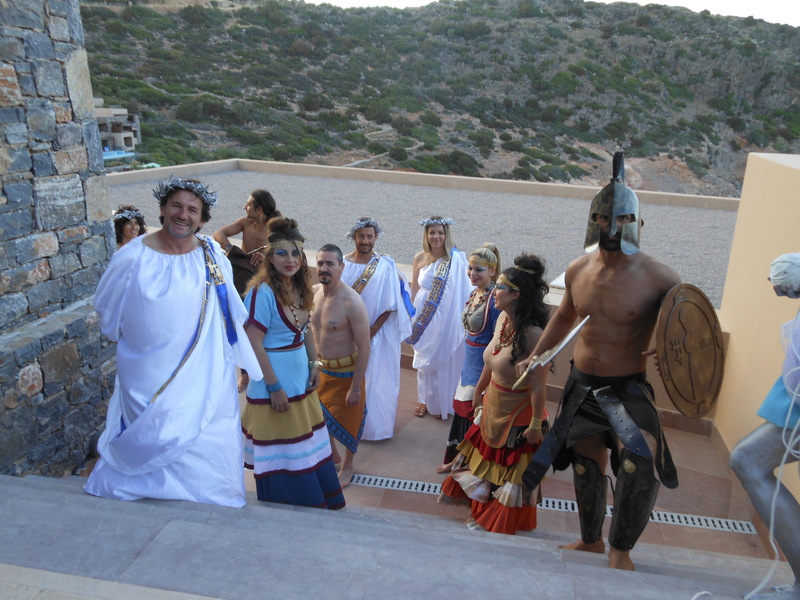 Metropolitan DMC selects the best, most thrilling Athens experiences to motivate your incentive group. Voted second on the list of best European destinations for city breaks in 2016, Athens surprises & charms visitors. The past few months have brought exciting new arrivals on the scene, most notably the much anticipated Wyndham Grand and the Electra Metropolis. 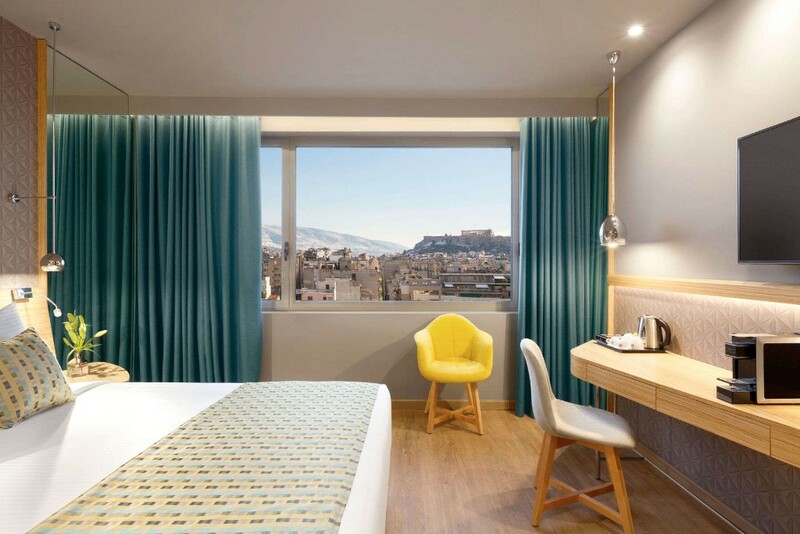 A new 5* Coco Mat Hotel in the Acropolis area is set to open in 2018. Stunning views combined with top notch service and new facilities ensure your delegates have an unforgettable experience. 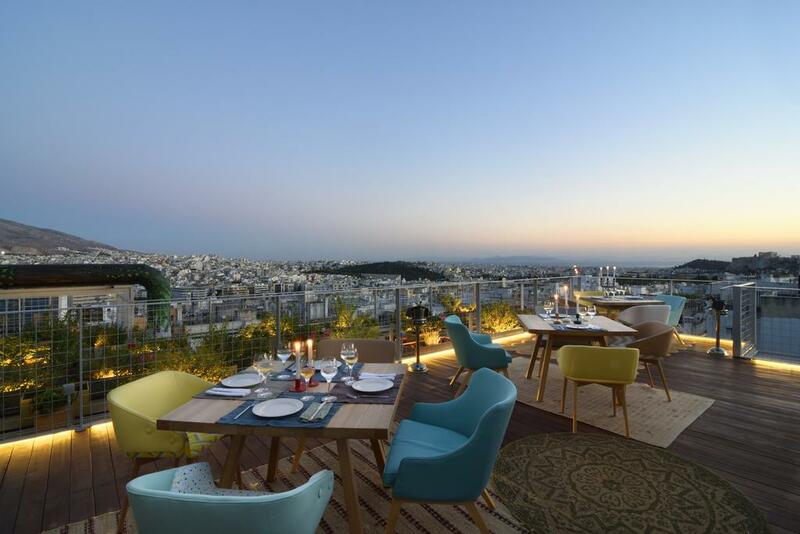 (from top to bottom) Electra Metropolis roof top bar, room with a view at the Wyndham Grand Athens, the existing Coco Mat Hotel in Kolonaki area. 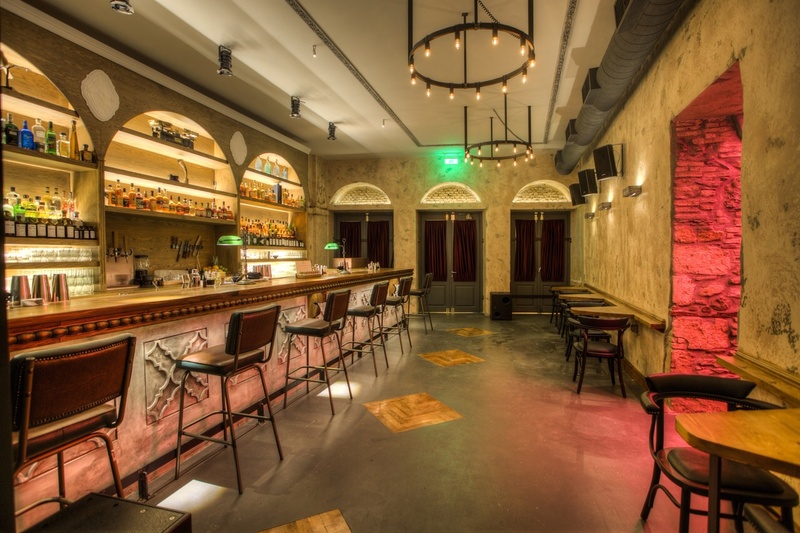 Athenians are known for their love of enjoying the finer things the city has to offer, meaning there is no shortage of bars and restaurants that are continually upping their game. 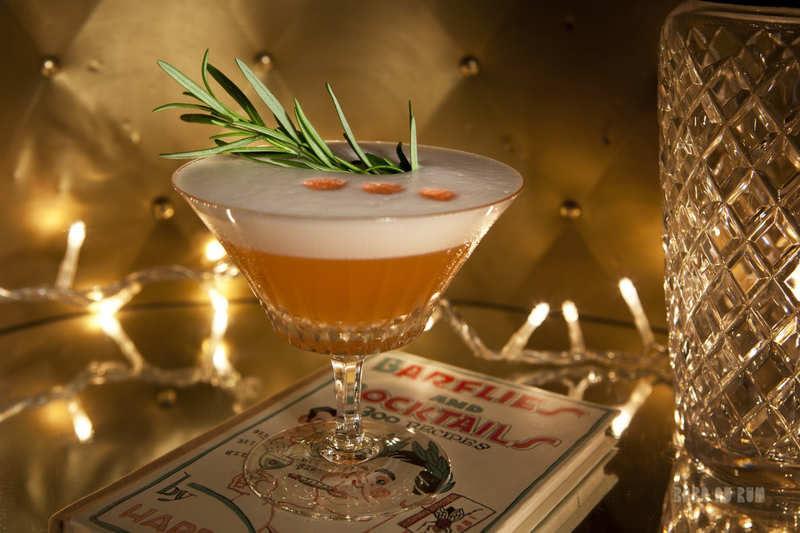 Cocktails are a serious business, and at Baba Au Rum they are treated with the respect they deserve! No wonder the bar earned a spot on the Worlds Best Bar Selection 2016. Another favourite is The Clumsies, a bar that combines a modern yet cozy atmosphere with world class cocktails. 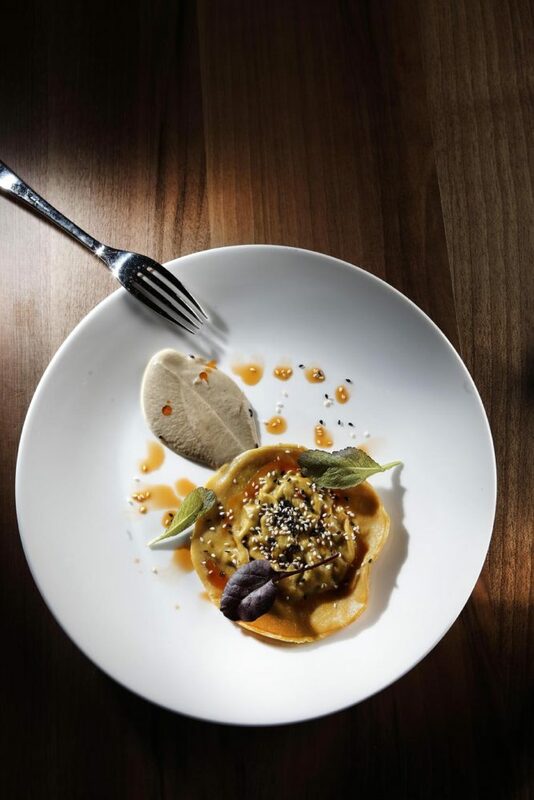 For cutting edge cuisine right next to the Acropolis head to Epta, a sophisticated and imaginative restaurant that seamlessly combines the classic and the modern. (from top to bottom) Unique cocktails created at Baba Au Rum, the Clumsies bar interior, a feast at Epta 7 Restaurant. To make the most of the amazing climate many forms of entertainment that are usually enjoyed indoors are taken outdoors. Amazing amphitheaters like the Herod Atticus, just below the Acropolis, or Epidavrus are truly unique and unforgettable. 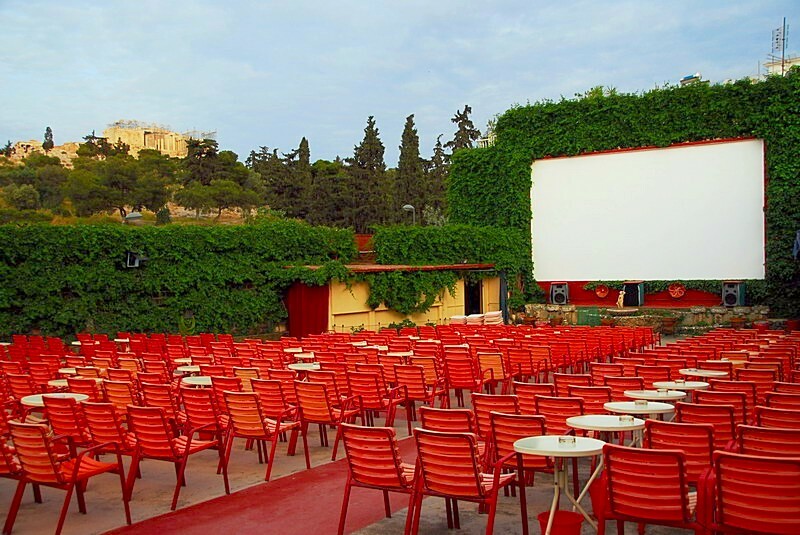 The open air cinema is another unique Greek summer experience. 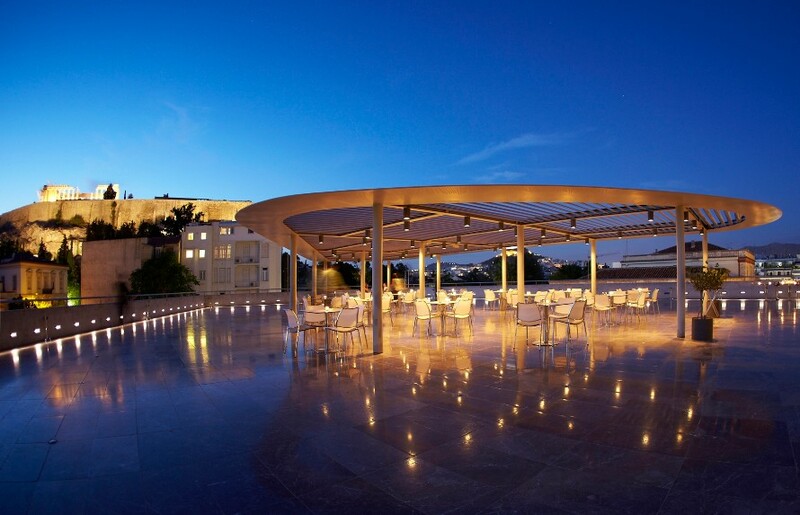 Set in lush gardens or on rooftop terraces, some with views of the floodlit Acropolis. 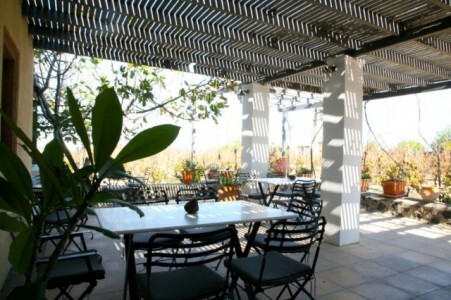 Let Metropolitan DMC arrange a private showing with cocktails & canapes under the stars! (from top to bottom) The Herod Atticus Odeon constructed around 174 AD, open air cinema in Thision area. The New Acropolis Museum houses an astounding array of marble sculptures & artifacts. 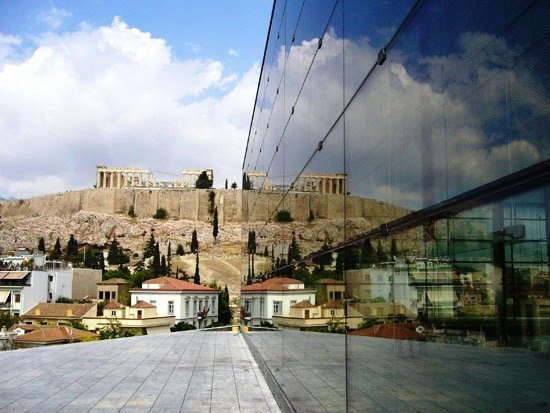 The building itself is a work of art based on the mathematical & conceptual clarity of the ancient Greeks with an award-winning restaurant facing the Acropolis. (from top to bottom) Terrace bar of the new Acropolis Museum, overlooking the Parthenon temple, and the temple itself. For more inspiring ideas contact Metropolitan DMC today and let us create an unforgettable incentive event. Athens may have a reputation for it’s relaxing atmosphere, however there is plenty to offer for those who prefer a more action packed program. Excitement, Adrenaline & Fun, Swimming & Snorkelling – all this in one seaside adventure on Athens coast! Super inflatable rib boat for a day of sea & sun along Athens Riviera. Stops are made at small islands and secluded coves for swimming, snorkelling and relaxing. Depending on time available, it is possible to cruise to the bay below the Temple of Poseidon at Cape Sounion. Here the group could disembark and enjoy a casual lunch at a simple seaside tavern before returning to the rib boats. 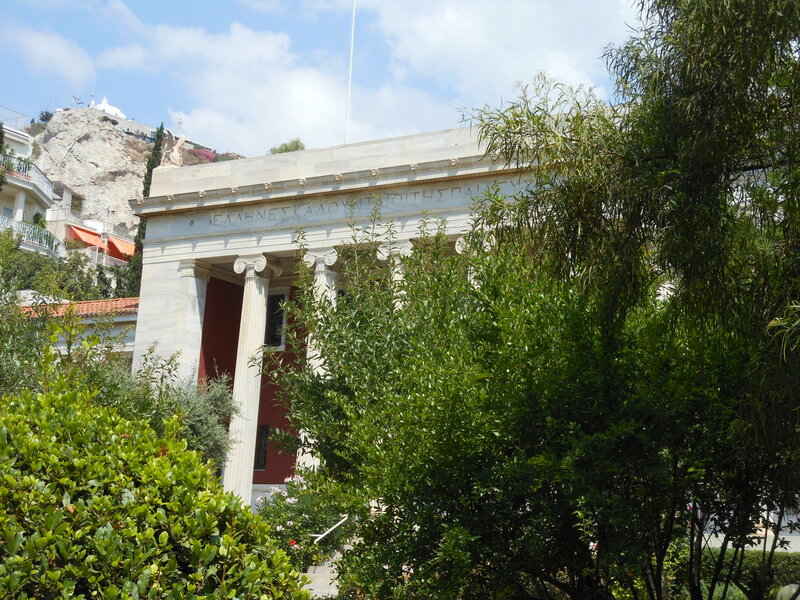 Explore the unique beauty of the Athenian architecture. 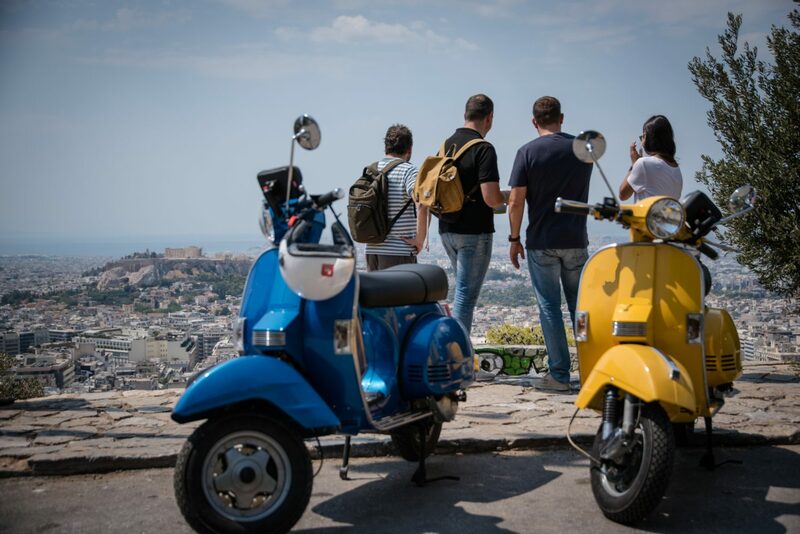 Your vintage scooter will offer you flexibility and comfort while discovering masterpieces of classic and contemporary architecture, exquisite neighborhoods and public spaces. A different way to approach sightseeing! One of the most well known Greek foods is feta cheese. It has been made from sheep and goat’s milk in this area of the world for thousands of years and since 2002, feta has been a PDO (protected designation of origin) product in the European Union. 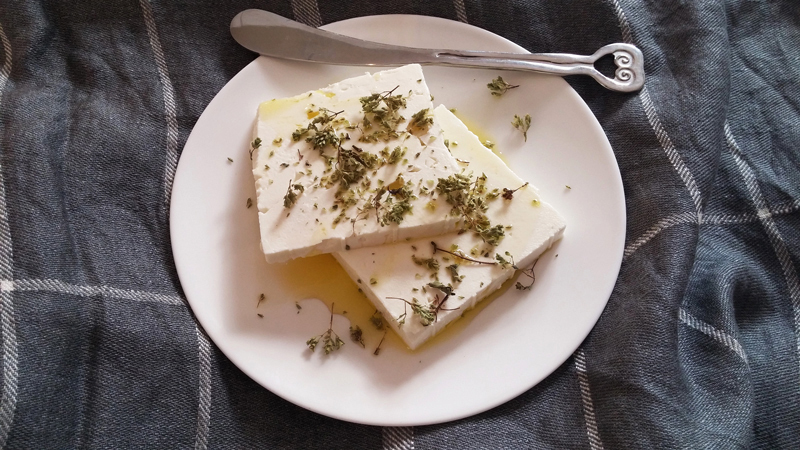 Outside of Greece there is mostly just one or two kinds of feta available but here there are many different types and varieties, dependent on the region in which they are produced. Some are sharp and strong, others mild and creamy while it can be aged in wooden barrels or metal vessels. Each type has its own distinctive taste and is used in different recipes. This delicious cheese is traditionally enjoyed on its own, in Greek salads and in pastries like ‘spanakopita’ and ‘tyropita’ (spinach and cheese pie respectively). But there is so much more one can use this versatile food for, from main dishes to dips and snacks, no wonder feta has been a favorite for centuries and is enjoyed all over the world. Here are a few ideas for how to enjoy it. 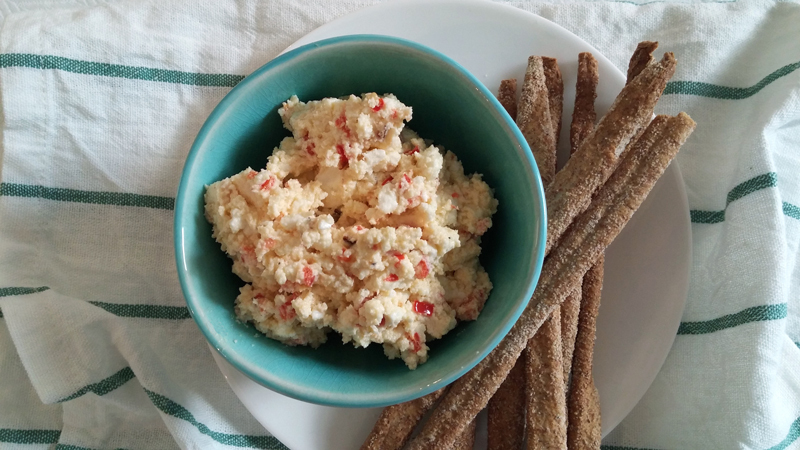 This is a hot spicy cheese dip made with feta and hot peppers. It’s incredibly simple to make and is a delicious accompaniment to crudités or crusty bread. Sautee some hot pepper in the pan until the skin is lightly browned and chop finely. If you like it hot, then use jalapeno or if you prefer a milder taste chose a different variety. Then using either a fork or a blender mash the cheese up and combine it with the pepper adding some olive oil to get the right consistency. The dip can remain chunky or be smooth, it’s up to you! This is a wonderful winter alternative to the classic Greek salad. Choose spinach or rocket for your greens and add some toasted pine nuts or flaked almonds for extra crunch. Go for a barrel aged feta that is crumbly and creamy. 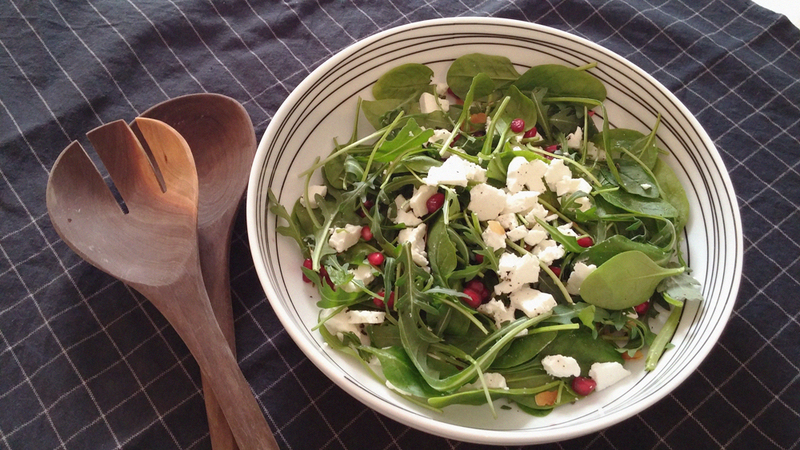 Simply sprinkle generously over the green leaves, adding the pomegranate seeds and toasted nuts. Use extra virgin olive oil in your salad dressing to bring out those authentic Greek flavours. Kali orexi or bon appetit! 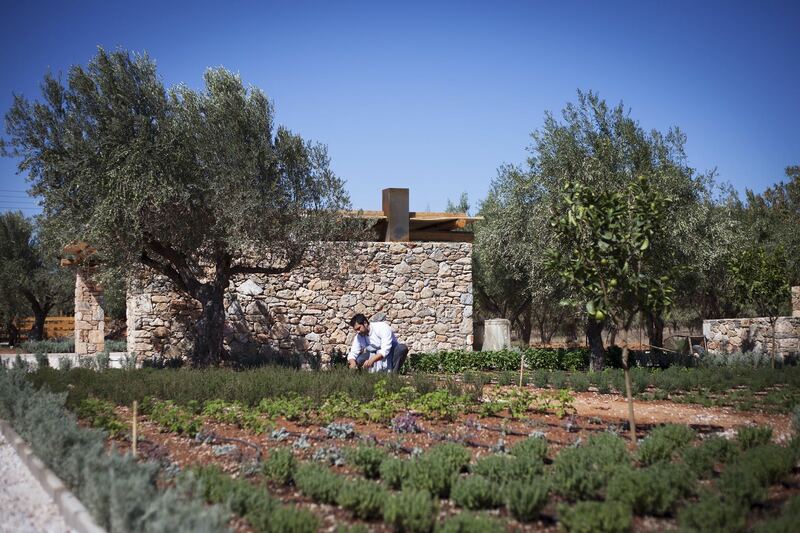 Visit us at www.metropolitan.com.gr or email us at info@metropolitan.com.gr to find out more about a corporate culinary journey in Greece. Christmas is a time of giving. We believe this caring and thoughtful outlook on life and our fellow human beings should define us all-year-round. 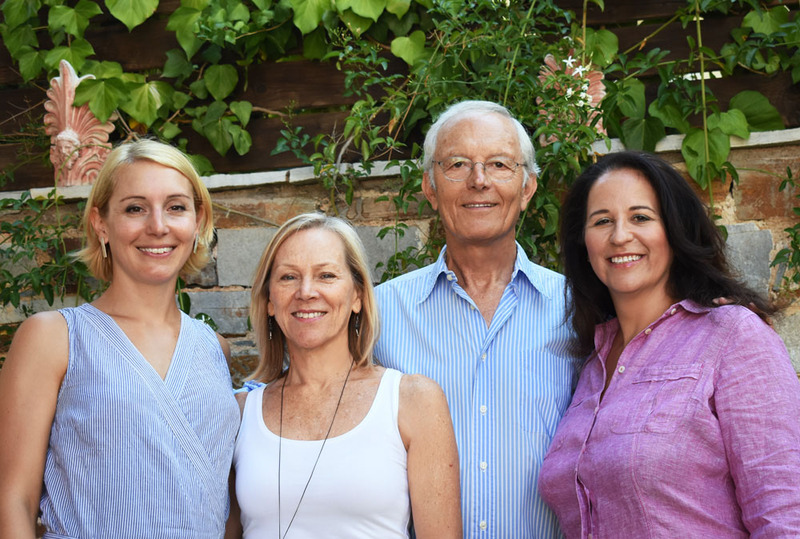 To this end, we have decided to launch a more far-reaching, holistic project to support causes in Greece close to our hearts and hope that our clients will be inspired to engage and complement our efforts. We have selected the Bodossaki Foundation as our partner. Since its establishment, the Foundation has administered over €400 million, in education, improving medical and research infrastructures, protecting the environment and reducing inequality of opportunities. We firmly believe that we rise by lifting others. Christmas is a time of giving. A time to consider those in need. A time to make a difference in someone’s life and help them improve their living conditions. We believe this caring and thoughtful outlook on life and our fellow human beings should define us all-year-round. 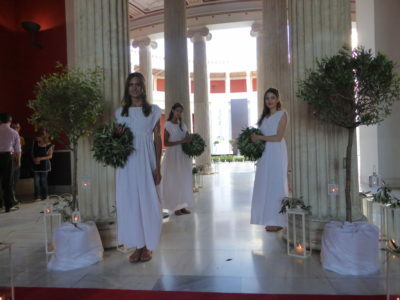 Metropolitan DMC and DB Meetings and Events are two companies who have for years specialized in tailor-made programmes in Greece for incentives, meetings, conferences and specialist groups. Recently, we have begun a collaboration, drawing from each others pool of expertise, contacts and inspiration, to optimize our capabilities for innovation in meetings, events and incentives in Greece. This Christmas, instead of sending out cards and gifts to all our esteemed clients and cooperators, we have decided to launch a more far-reaching, holistic project to support causes in Greece close to our hearts. 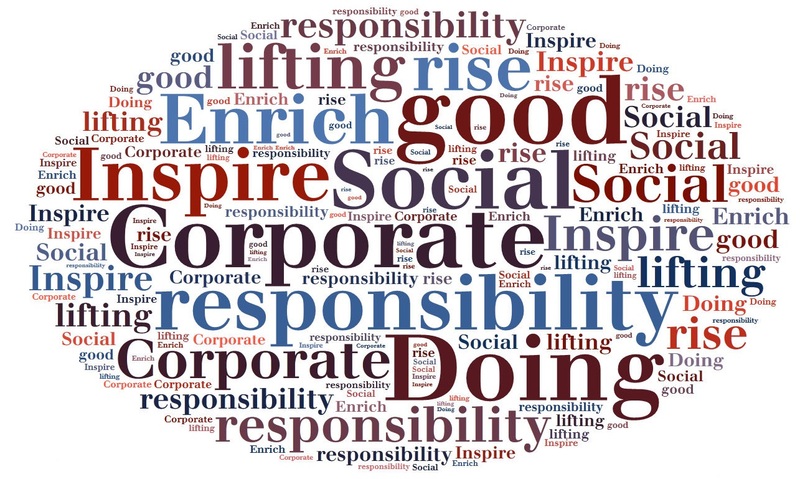 Throughout the coming year, we will be introducing a tailor-made corporate responsibility element into all our quotes and proposals, in the hope that our clients will be inspired to engage and complement our efforts. We will regularly share information on what we achieve. And clients participating in a specific event will be kept abreast of the impact their participation has had. All the causes are in support of individuals and institutions in Greece. People who believe in the uniqueness of this little corner of the world, its beauty, its amazing energy and its potential for excellence. To ensure transparency, efficiency and due diligence in all our CSR activities, we have selected the Bodossaki Foundation as our partner. The Foundation was established in 1973 and is one of the largest privately owned public-benefit organizations in Greece. Since its establishment, the Foundation has administered over €400 million, in education, improving medical and research infrastructures, protecting the environment and reducing inequality of opportunities. We firmly believe that we rise by lifting others. 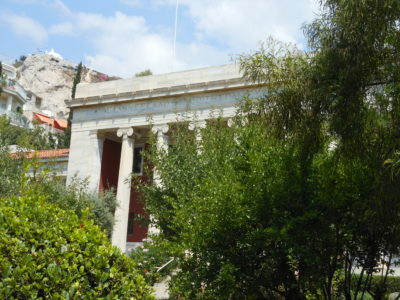 Athens is a one of a kind beautiful city with many hidden gems waiting to be discovered. Here at Metropolitan DMC we have selected four of the most unique and surprising venues that will give your incentive group an unforgettable experience. Zappion is an historic landmark dating back to 1874. 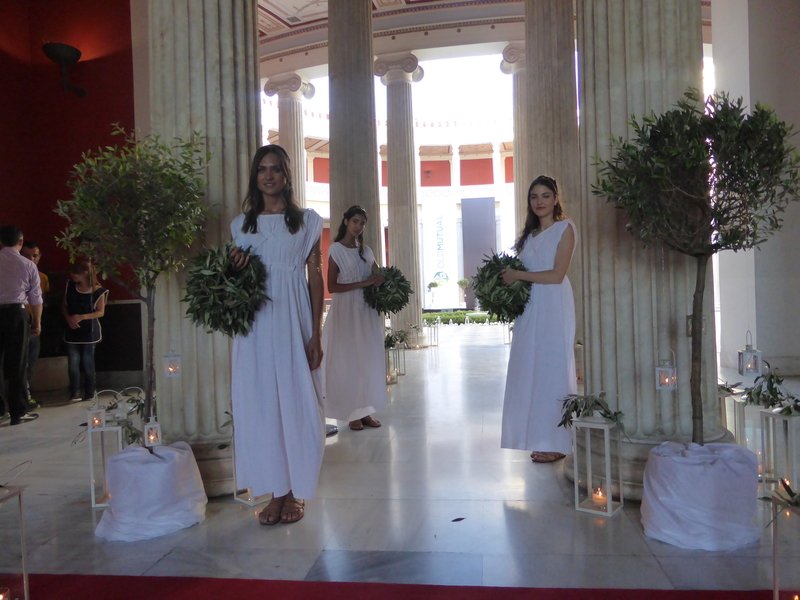 The stunning neoclassical building, located in the heart of the city, is a venue to truly impress and inspire. Inside the building a circular atrium, open to the Greek sky & surrounded with marble columns creates a uniquely Greek space. 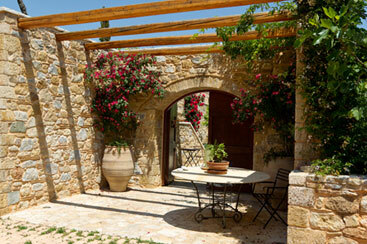 This charming farm is located on the outskirts of Athens, surrounded by olive trees and vineyards. Delicious organic fruit and vegetables, all produced on the farm, allow you to sample Greek cuisine at its freshest and finest. An event at the farm includes a visit to the gardens, a cooking demonstration and al fresco meal accompanied by live music. 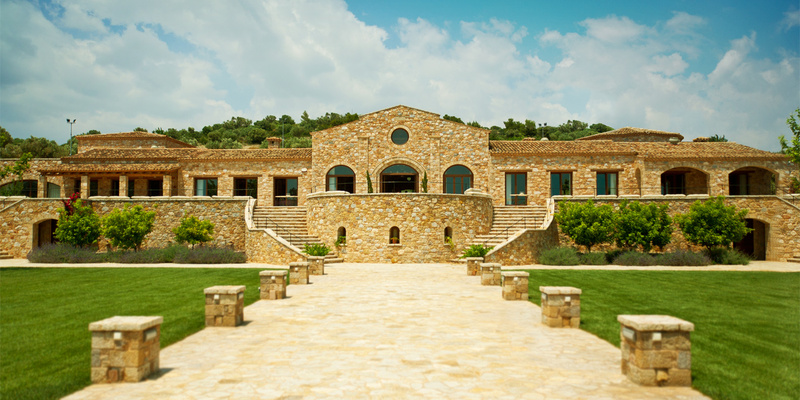 This gorgeous, purpose built winery welcomes you with sprawling lawns and local stone. 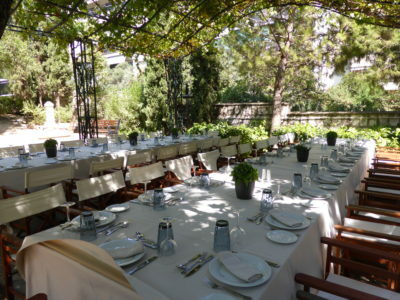 The size of the building itself as well as the imposing interior, magnificent terrace and cool green garden make this versatile venue perfect for an event at any time of the year. The beautiful neo-classical building hides a secret garden nestled in the heart of the bustling city. The cool, manicured garden is the perfect setting for a memorable breakfast, a bespoke picnic, or a sophisticated cocktail party. Source a stunning location for hard working winners to relax, destress and spend quality time with their colleagues. Create a finely-balanced program both exciting & fulfilling without being rushed. Two private yachts with several common areas on sundecks allowed guests to socialize together or relax alone during sailings. 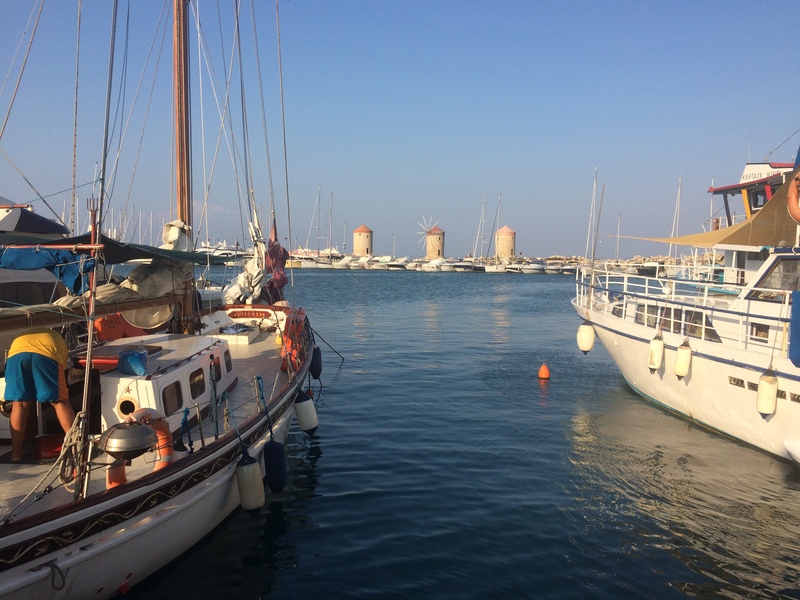 The route around the lesser known Greek Islands of the Dodecanese was the perfect backdrop for the most relaxing possible incentive event. Visits to quaint villages, awesome archaeological sites and buzzing towns wowed the delegates on land. Swim stops in small bays with crystal clear waters kept everyone cool. Watersports injected some thrilling action. 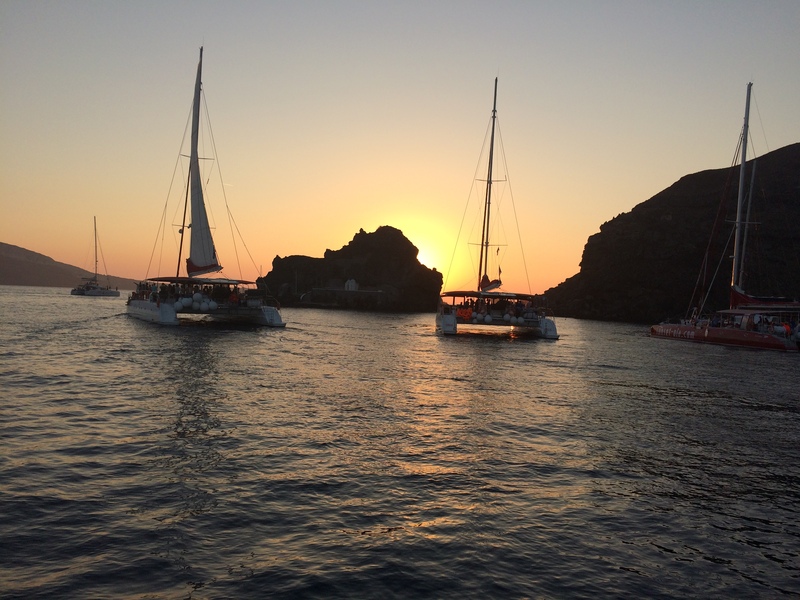 Evenings in port offered the opportunity to experience delicious local cuisine, explore the shops and night life. At the end of the week guests had the opportunity to spend the last night in a 5* property on land but voted unanimously to remain on board until the last possible moment. Mission accomplished by Metropolitan DMC! Wine has been an important part of Greek culture for over 4000 years. The ancient Greeks loved to organize intellectual gatherings called “symposia” where they would eat and talk about philosophical subjects while drinking wine. 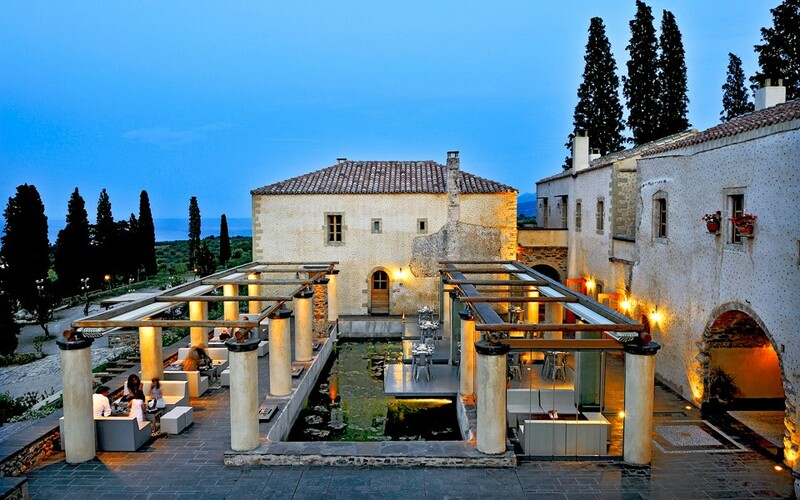 Wine tours in Greece, like every other aspect of life here, are inextricably entwined with the ancient culture.The outstanding location of some of the wineries & unique growing conditions makes a wine tour in Greece very attractive. 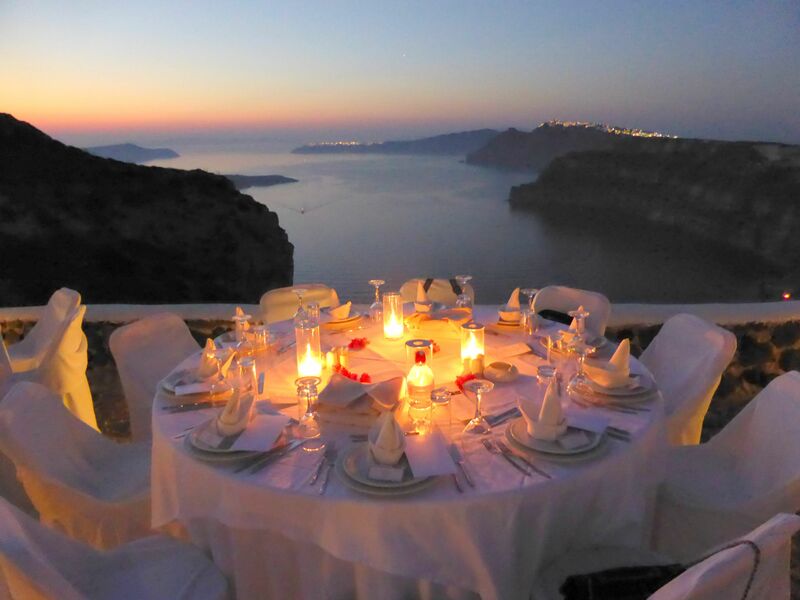 While there are important wine growing areas in northern & southern parts, the breathtaking island of Santorini is one of the most exciting places to learn about wine in Greece, creating an exceptional incentive experience. 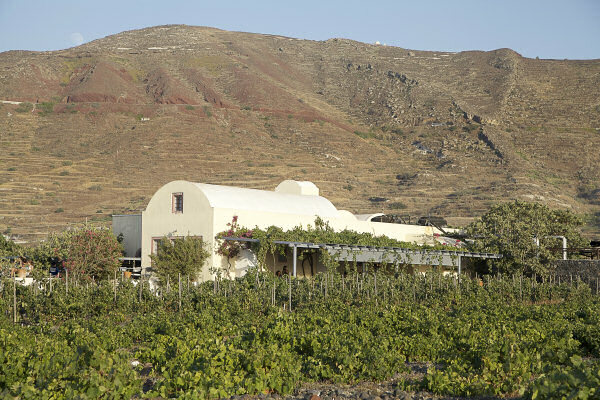 The different wines of Santorini owe their special qualities to the unique geology of the island. The volcanic explosion, circa 1650 BC, covered the island with volcanic ash, lava and pumice stone creating the foundation for perfect soil conditions which now produce very distinctive & unique wines from local grape varieties such as Assyrtico, Mandilaria and Vinsanto produced from sun dried grapes. Venetsanos Winery is located in the most breathtaking location offering incredible vistas over the caldera and volcanic islands. 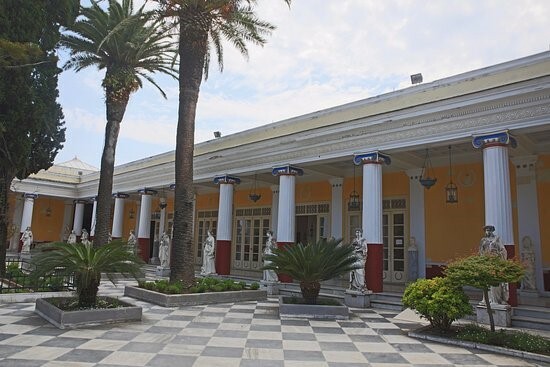 Built in 1947, the exceptional architectural structure is combined with the history of one of the most important wine producers in the Aegean. Its most distinguished feature the structural design, which essentially used gravity, facilitating energy efficiency, at a time when access to electricity and other energy sources was very limited. A visit to the winery is a walk through history & tradition with a tasting of some of the exceptional wines in an exceptional setting. 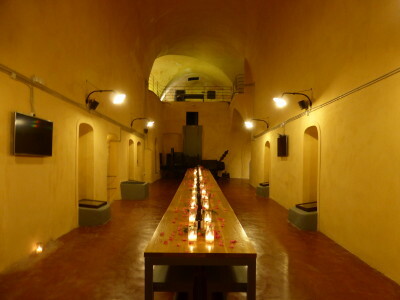 The winery is also an incredible setting for an outstanding gala dinner. Domaine Sigalas produces some of the most highly acclaimed wines with ancient varieties such as Athiri, Mandilaria and Assyrtiko. 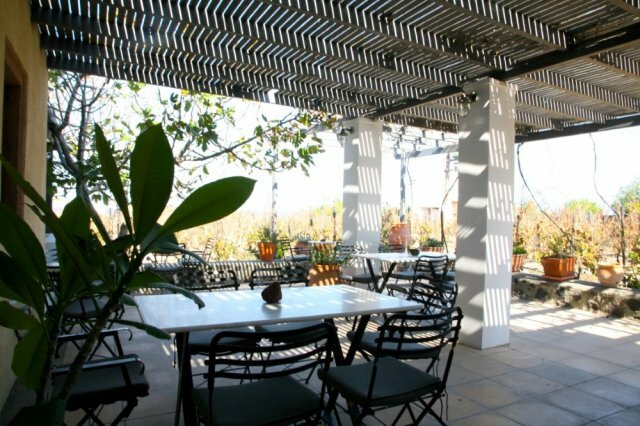 The scenic location of the winery and the lovely west-facing terrace provided a magical place to taste & learn about Greek wines and food. Assyrtiko, first grown on Santorini, gives a bone-dry wine that has citrus aromas mixed with the characteristic earthy flavors that the volcanic soil of Santorini provides It ends with a pleasantly mineral aftertaste. Vinsanto the unique, naturally sweet wine is made from the traditional method of letting the grapes dry under the sun for 10 days to concentrate their juice. The wine is kept in barrels for many years and develops a wonderful color and bouquet with hints of chocolate, coffee, butter, honey, and flowers. -The Greek Islands – first again! Santorini is still riding the wave of popularity as the top Greek Island destination, and rightly so. The tiny island experience is both spiritual & sensual with the endless blues of the sea & sky over the ancient caldera. 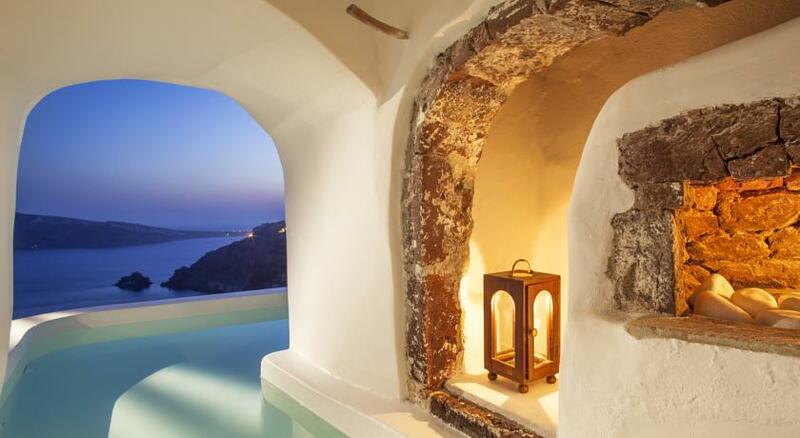 Conde Nast Traveller has placed two Santorini resorts in the 2015 top 30 best hotels in Europe with Canaves Resort in first place & Perivolas Resort in third place. Both resorts are located in Oia village with outstanding architectural design, world-class service & breathtaking views.